Struggles by Michigan State have left the door wide open inside the Big Ten where some surprising upstarts like Iowa and Indiana are playing very well. 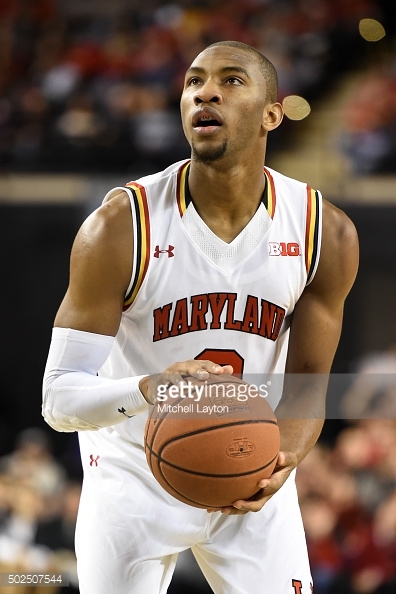 Even so, Maryland comes in as the top dog in the first Big Ten power rankings of the new year. The Terps haven't won pretty much this year; they have survived tons of close games. But, they are about as versatile as you can get, as Melo Trimble and Rasheed Sulaimon lead an explosive backcourt, and the young frontcourt guys, Diamond Stone and Robert Carter, are figuring it out. A bad loss to a Michigan team without Caris LeVert was certainly worrying, but no team in the conference has the amount of pure talent as Maryland. But, in this sport that obviously doesn't always mean consistent success. Though, without a clear-cut frontrunner, Maryland fills in. After the football team's unexpected success and rise to the Big Ten Championship Game, not a whole lot was expected of the basketball program. Sure, an NCAA Tournament bid seemed likely, but few fans could have predicted the Hawkeyes' flaming hot start to conference play. A 5-0 start has been highlighted by a sweep of Michigan State, and a thrilling comeback victory over Purdue. Iowa isn't the flashiest team, but they get by with stud forward Jared Uthoff (perhaps the Big Ten POY frontrunner) and a very experienced and deep lineup. Iowa has already risen to a Top 10 ranking behind their scorching play. If they keep it up, they could be sitting in firm grasp of the Big Ten. Expectations were high in Bloomington this season, and the opening month for Indiana did not seem too promising. The Hoosiers dropped games to Wake Forest and UNLV and then played very uninspired in a 20-point drubbing at the hands of Duke. Since then, they have gone 11-0 and undefeated in conference play behind the play of veteran guard Yogi Ferrell and Robert Johnson. Though, their schedule so far in conference play has been very soft, and it is hard to know if the Hoosiers truly have turned the corner. Not helping is the loss of electric guard James Blackmon, who could be out for the remainder of the year. For much of the non-conference slate, MSU held the nation's No. 1 spot and looked like perhaps the nation's best overall team. Though, as conference play has begun, the Spartans have struggled. They have lost four games inside the Big Ten, two to Iowa and one to a not great Wisconsin team, and then a brutal showing against Nebraska. Maryland awaits next and a loss there would certainly be a wake up call that something needs to change. Earlier losses in the year could be blamed on the fact stud guard Denzel Valentine wasn't playing. Valentine is healthy, and the Spartans just look stagnant offensively. Though, counting out Tom Izzo and MSU is certainly never a good thing. Give Matt Painter plenty of credit for what he has done with his Purdue program, which looked dead in the water a few years back. The Boilermakers have rocked a dominant front line this season, that includes senior A.J. Hammons and big-time recruit Caleb Swanigan. Though, just as important has been the play of guard P.J. Thompson and a suddenly deep bench. Purdue has beat up on some low-tier Big Ten teams but also lost to Illinois. As Maryland and MSU awaits, we will truly see what the Boilermakers are made of. The Wolverines appear as a confusing team in the landscape of the Big Ten and the entire nation. They have played very poor in a number of big games this season (SMU, UConn), but have also beat Texas and Maryland, without their best player, Caris LeVert. LeVert who has struggled with injuries throughout his time in Ann Arbor, will have to stay healthy. Though, the play of guard Duncan Robinson, an absolute sniper, and rock steady point guard Derrick Walton has lifted Michigan to the top ranks of the conference, and a clear cut NCAA Tournament team. Could this finally be the year? Could this year be the year Northwestern finally makes their first ever NCAA Tournament appearance? What Chris Collins has done in Evanston has been unbelievably impressive. The son of NBA legend Doug Collins, Chris has Northwestern playing terrific, and nearly upsetting Maryland. Bryant McIntosh leads the way, a fearless guard averaging 15.6 points per game and 7.1 assists per game. Alex Olah gives the Wildcats strength underneath, and the roster just overall has more versatility. The 'Cats get a rough three game stretch of Indiana, MSU and Iowa before a pretty easy slate. If they can steal a victory in either of those games and take care of business against inferior teams, they very well could be playing in March. Not much was expected out of Nebraska entering this year. They were coming off an extremely disappointing year that included head coach Tim Miles locking them out of the locker room because of their struggles, and had just lost Terran Petteway and Walter Pitchford early to the NBA (neither were drafted). Instead, the addition of former Kansas Jayhawk Andrew White has re-energized the offense that also includes the streaky Shavon Shields. An NCAA Tournament bid may be out of the question, but a NIT run would certainly be a nice way to wrap up the year in Lincoln. Life after D'Angelo Russell has not been easy for Ohio State. The Buckeyes began their year 2-4, with losses to Texas-Arlington and Louisiana Tech. Though, the Buckeyes have mostly settled the ship to playing competitive basketball. Jae'Sean Tate and JaQuan Lyle are unbelievably young but are starting to show signs of becoming a lethal backcourt. The versatile Marc Loving has been solid, and Ohio State has a relatively soft stretch. It could be the perfect opportunity for them to prove themselves towards some type of postseason bid. For years Wisconsin has been the model of consistency in a chaotic and ever-changing sport. Their swing offense, large group of seniors and selfless attitude has made them a consistent NCAA Tournament squad. But, the hangover after two straight Final Fours has been rough. Bo Ryan ended his long and wonderful career abruptly and the Badgers have clearly missed Frank Kaminsky and Sam Dekker. Though, quietly Nigel Hayes is having a big junior year and new head coach Greg Gard seems to be getting more comfortable. While a third straight trip to the Final Four is completely out of the question, the Badgers could still have plenty of momentum going forward. Overall, Penn State has been solid this season. Sure, nobody is going to be crazy about an 11-9 mark and an unimpressive conference mark, but the Nittany Lions have shown signs of life this year under Pat Chambers. But, losing to teams like Radford and Duquesne has not helped instill much confidence into the future of the program. Guard Shep Garner is a solid contributor, and forward Brandon Taylor has developed into a solid scorer. Penn State has plenty of experience and could be a dangerous player down the stretch. But, a postseason bid just doesn't seem very likely at this point in the year. After a brutal football year that included Illinois making a weird and ill-timed firing of Tim Beckham less than a week before the season, Illinois fans hoped basketball would be a saving grace. Instead, it has instilled more belief that the entire athletic department needs a makeover. John Groce is trending in the complete wrong direction, after a great start to his tenure in Champaign. Malcolm Hill has been an electric scorer this season for the Illini but he has been really the only good thing. The offense is one-dimensional, they turn the ball over way too much and they don't play hard. Unless things change quick, Groce could very well be looking somewhere else for a new gig. The third year of the Richard Pitino era in Minneapolis has been brutal. The Gophers are sitting at 6-13, winless in the conference and have lost to South Dakota, South Dakota State and UW-Milwaukee. Even so, there may be a glimmer of hope for the team. Guard Nate Mason has been playing great lately, and swingman Jordan Murphy has a bright future. With the amazing amount of youth on the roster, a dip this season was expected. Gopher fans are already looking ahead to next year, when high profile in-state recruit Amir Coffey arrives on campus. The aftermath of the Mike Rice scandal is still felt in the Rutgers basketball program. The team has made little progress under alum Eddie Jordan, and they lost by 50 to Purdue just days ago. Guards Corey Sanders and Bishop Daniels are solid, if rather underwhelming playmakers. But, there is little talent beyond them in Piscataway, New Jersey. Jordan will continue to recruit, but at some point the product has too change on the court.